This collectible book has all the instructions for earning the old Brownie Try-Its. It has been retired from official use, but still includes fun activities for Brownie Girl Scouts. It is also a fun item for a collector of Girl Scout memorabilia! Spiral bound. All retired merchandise has been stored new in the GSEWNI Council Store, but may show signs of it's age, including light damage to books or boxes. Retired merchandise in non-refundable. This collectible book set includes the old Brownie Girl Scout Handbook, including fun stories and activities for Brownies, and theTry-Its for Brownie Girl Scouts book, which has all the instructions for earning the old Brownie Try-Its. These books have been retired from official use, but still include fun activities for Brownie Girl Scouts. They are also fun items for a collector of Girl Scout memorabilia! Two spiral bound books in a collector's box. All retired merchandise has been stored new in the GSEWNI Council Store, but may show signs of it's age, including light damage to books or boxes. Retired merchandise in non-refundable. This is the Spanish-language version of the Brownie Girl Scout Handbook. This collectible book has all the information a Brownie Girl Scout could need. It has been retired from official use, but still includes fun activities and stories for Brownie Girl Scouts. It is also a fun item for a collector of Girl Scout memorabilia! Spiral bound. This collectible book has great information for Leaders of Brownie Troops. 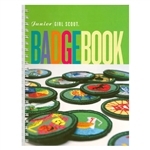 It has been retired from official use, but still includes fun activities for Brownie Girl Scouts and advice for leaders. It is also a fun item for a collector of Girl Scout memorabilia! All retired merchandise has been stored new in the GSEWNI Council Store, but may show signs of it's age, including light damage to books or boxes. Retired merchandise in non-refundable. This collectible book has been retired from official use, but still provides great information for Daisy Leaders today. It is also a fun item for a collector of Girl Scout memorabilia! Spiral bound. All retired merchandise has been stored new in the GSEWNI Council Store, but may show signs of it's age, including light damage to books or boxes. Retired merchandise in non-refundable. This is the Spanish Language version of the Daisy Girl Scout Activity Book. This collectible book has been retired from official use, but still provides fun activities for Daisy Girl Scouts today. It is also a fun item for a collector of Girl Scout memorabilia! Spiral bound.